This is not the kind of news you want to hear in early morning. Prominent activist and blogger Alaa Abdel Fattah and other 24 protesters have been sentenced 15 years in jail and 100,00 LE Fine early morning in absentia. This is just ridiculous when you hear what happened in today's session. Another episode of that on going TV series in crazy verdicts in Egypt. 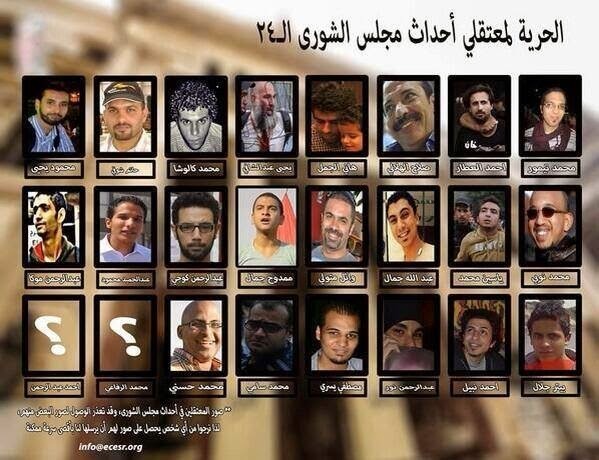 Today the Cairo criminal sentenced the 25 protesters in the Shura Council clashes trial. The judge issued his sentence in absentia despite the fact that Alaa Abdel Fattah , Wael Matawally and Ahmed Abdel Rahman , the defendants were waiting outside the court "at police academy" and were trying to get in. The court claimed that the defendants did not show up where as there were thee of them trying to get in. Needless to say the three were arrested and currently in detention. Of course as this is an absentia court verdict , I believe there should be a retrial. A photo for Alaa earlier this morning "Al Masry Al Youm"
BY the way Alaa did not call for this protest , the No For Military Trials campaign called for it. He did not steal the Walkie Talkie or attack any officers. There are video and photos showing the whole affair. There are other protesters in the trial , please do not forget them. Among those Wael Matawally is a mobile phone apps developer , already he and his company were awarded. Wael is a dual nationality citizen and got an Italian passport yet he has never used it. 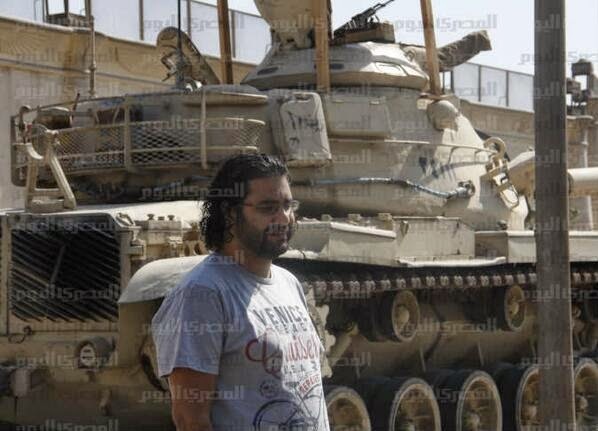 Alaa Abdel Fatah is still facing two trials by the way : Torching Shafik's campaign HQ and insulting judiciary. You keep saying there are photos showing this,Where are they?